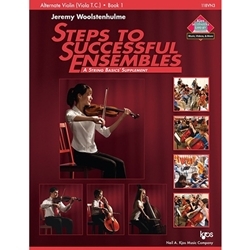 Steps to Successful Ensembles is an extraordinary new collection of 24 ensembles loosely correlated with String Basics Book 1, the new comprehensive string method by Shade & Woolstenhulme. Arranged for string orchestra, music includes arrangements of classical themes and folk songs, and also includes original selections by Woolstenhulme. Already classroom tested and performed in concert, this collection is a definite hit with students and audiences.